The Chipotle Chile Pepper is grown in Northern and Southern Mexico. Chipotle Chiles are not a type of Chile pepper. Instead, they are the dried and smoked green Jalapeno Chile Pepper. Ground Chipotle Chilie Peppers are made from the dried and ground pods of Capsicum, a pepper indigenous to Mexico. Chipotle (chee-po-tleh) chiles are made distinct because they are smoke dried jalapeño peppers. Chipotle Chile Peppers appear as a very wrinkled dark tobacco brown chile with a strong smoky aroma. In recipes, Chipolte Chile Pepper adds a special combination of smoky, sweet meaty flavor with intense heat. Shake Chipotle Chile Pepper on grilled or roasted meats. 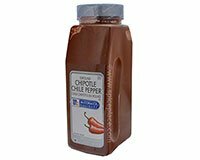 Add McCormick Chipotle Chile Pepper to soups, sauces, stews, salsas, barbecue sauce and salad dressings. Sprinkle Chipotle Chili Pepper into seafood dishes such as shrimp, crab cakes and stir fry dishes.